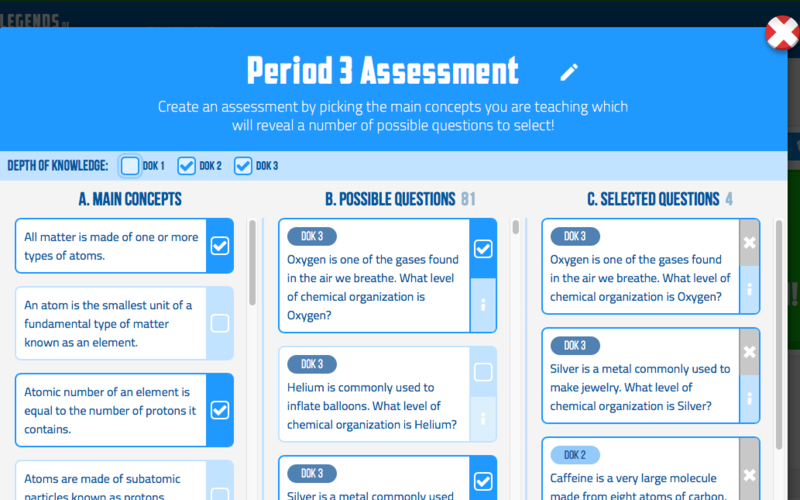 In addition to including games when creating a playlist, you can also include assessments. An assessment consists of questions the students must answer (not necessarily correctly), as part of a playlist. Assessment questions are selected randomly from a question bank set up for the particular learning objective. For users with paid accounts, you can also populate assessments with questions you choose from the question bank. As an example, this playlist named "Period 3" is populated with games, but does not yet contain any assessments. To add an assessment, open the ASSESSMENTS tab below the playlist editor. To create an automatically-populated assessment, click RANDOMLY SELECTED QUESTIONS. The assessment is given a default name and a default number of questions. To change the name, click the Pencil icon, and to change the number of questions, use the arrows to increase or decrease. After clicking SAVE, the assessment is saved in the ASSESSMENTS tab, where it can be used in any playlist within this learning objective. You can delete it with the X icon, or edit it by clicking the Pencil icon. If you have a paid account, you can also use the CHOOSE YOUR QUESTIONS assessment option. To build your own assessment, first, at the top of the window, choose one or more Depth of Knowledge (DOK) levels you want to assess. Then in the MAIN CONCEPTS column, choose one or more concepts you want to assess. This will produce a list of questions from which to choose, displayed in the POSSIBLE QUESTIONS column. 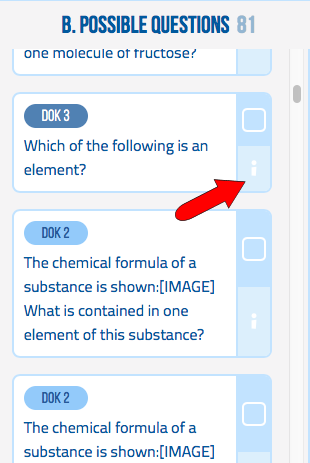 To view the multiple choices for a particular question, click the "i" icon. All choices are listed, with the correct choice displayed in green. From the POSSIBLE QUESTIONS column, select the questions you want to include in the assessment. These questions appear in the SELECTED QUESTIONS column, in the order in which they were selected. 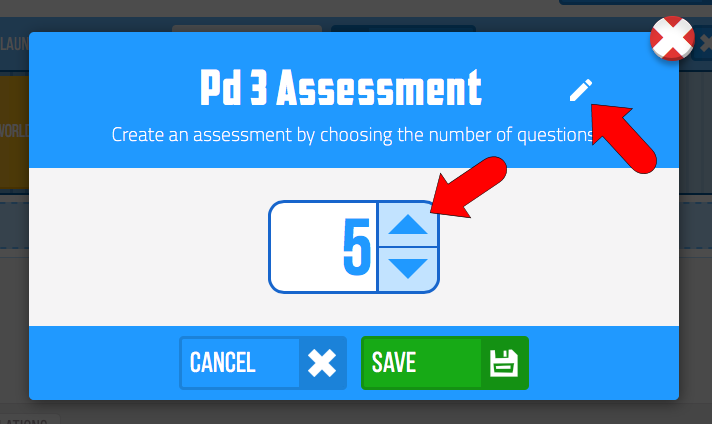 You can also use the Pencil icon at the top of the window to change the name of the assessment. All assessments you create, of either type, are listed in your ASSESSMENTS tab. Changes can be made by clicking the Pencil icon. To add an assessment to a playlist, simply drag it from the ASSESSMENTS tab into the playlist editor. By default, an assessment is added to the end of the playlist, but you can drag it to any location. The suggested time is one minute per question, so the five-question assessment in this example is allotted five minutes. Any assessment you add to a playlist can be edited by clicking its Pencil icon. Note that editing an assessment within a playlist does not change the template saved in the ASSESSMENTS tab. After you launch your playlists and students begin play, all assessment questions must be answered before proceeding to the next game or question in the playlist. Students will be told whether their answers were correct. You can differentiate your playlists by editing assessments for different class periods, or for separate playlist tracks. When you track student progress, all assessment answers will be displayed, both for the class overall and for each student. 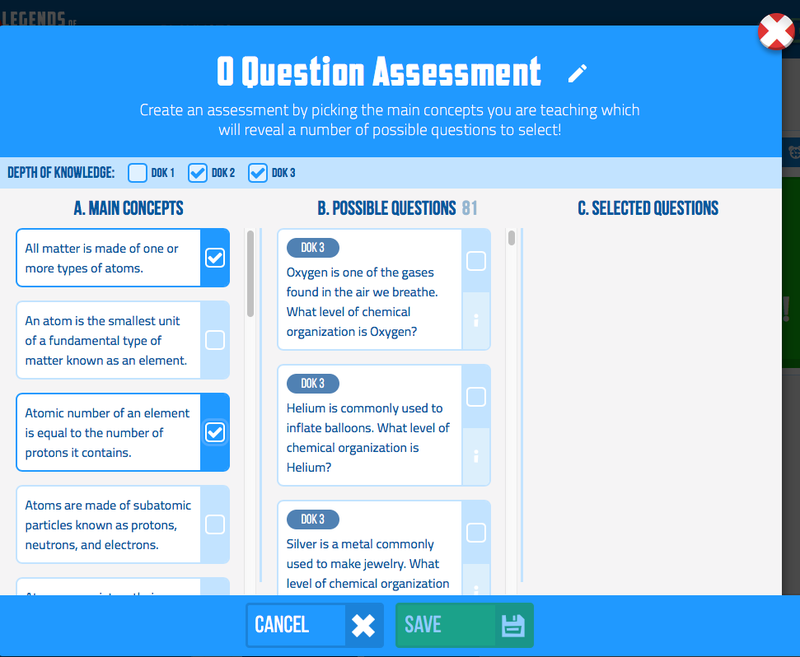 If you create "Choose Your Question" assessments, these will be listed first in the results, followed by any game questions which will be listed under "Other Questions." If you create assessments with randomly-selected questions, these will be included with any game questions, all listed under "Other Questions."